BMS Lawn & Landscape offers a weekly service to support a beautiful lawn during the growing season. A weekly program of mowing, trimming and blowing off all walkways and drive areas. BMS Lawn & Landscape can check this chore off your list to allow you more free time. 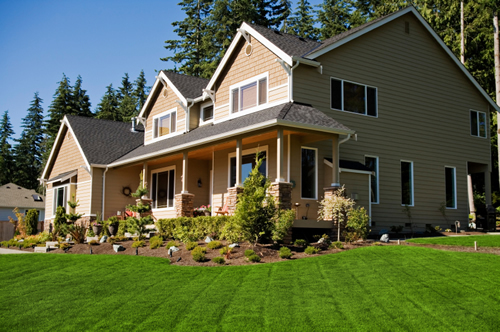 A landscape renovation not only adds beauty to your home but raises the property value. Money magazine estimates that you can expect to recover 100 - 200 percent of your landscape investment when it is time to sell your home. Professionally installed landscaping that integrates patios, walkways and water features can greatly reduce the amount of weekly yard care. Incorporating a patio will increase the living space in your yard, while decreasing maintenance. A water feature will provide an instant escape and relief from the stress and tension of the day. Whether a water garden or a pond less water feature, it will bring a sense of serenity to a landscape providing a place to rest, reflect, and relax. Imagine having a haven in your own yard where you can go to escape the challenges of daily living. When you’re ready to make plans call BMS Lawn & Landscape. Our maintenance contracts are designed to give the customer full service. We offer discounts to those customers who enroll in a one year service contract. Call us today and let us help you create a custom contract that best suits you.